As we only staying in London for a few days I had to think strategically about adventures which would appeal to all the family. Top on the list were the London Zoo and the Natural History Museum (both visited and enjoyed) but sightseeing tours around historical monuments were out as I wasn’t keen on testing the patience of a jet-lagged toddler. 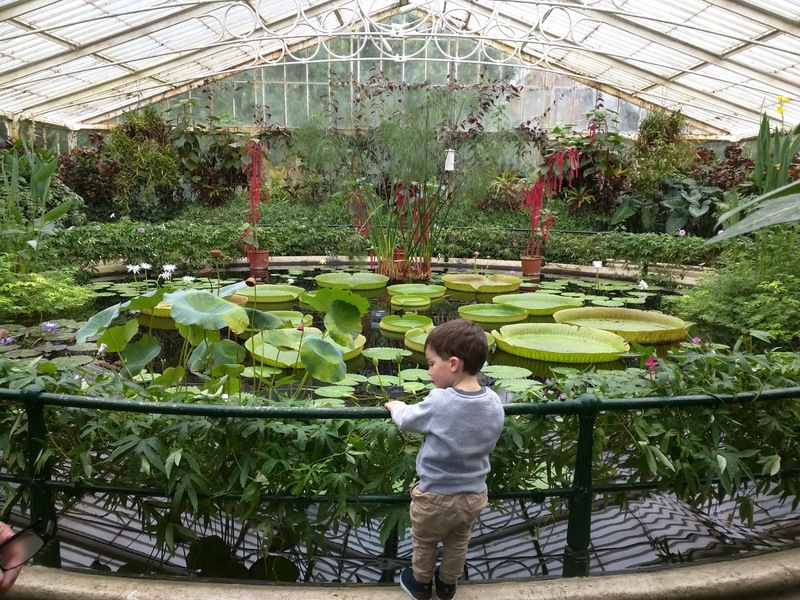 My mother, Mrs Proff, is a keen gardener and may have mentioned one or two times (or more) that the Royal Botanic Gardens at Kew are amazing. Me being me, had not really paid it much attention until now. When I planned to visit there with the MAP family, she jumped at the chance to show us around so we all bundled onto the tube and headed down to Kew. It started to drizzle* just as we arrived so Mrs Proff suggested that we visit the glasshouses. The first one we arrived at was the Palm House. This iconic structure was built in 1840 and houses a staggering array of palm trees from all over the world. It even hosts the oldest recorded potted plant, which is known to be over 240 years old. 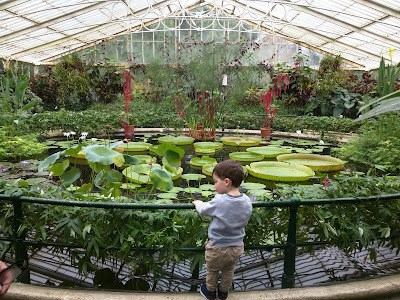 The greenhouse was warm and humid and, whilst the grownups marvelled over the size of the plants and titbits of trivia, Mini Monkey explored the nooks and crannies of glasshouse. Our second glasshouse was the much smaller Lily House. What the Lily House lacks in size it certainly makes up for in impact. I was blown away with the view of Giant Lily pads and the reflection of the iron structure of the glasshouse roof on the water. Mini Monkey and Mr MAP took a lap around the pond looking for fish and (presumably giant) frogs whilst Mrs Proff and I took a pause to soak in the view. The final glasshouse on our tour, The Princess of Wales Conservatory, is the newest at Kew. The ten different zones in the glasshouse ranged from a cool, dry Australian climate (oh the irony to travel half way around the world to see native plants) to hot and humid tropical. There were more giant lilies (still no giant frogs), fish, orchids, cacti, bryazoa and a host of plants I couldn’t even begin to identify. One of the small side rooms contains a fascinating display of carnivorous plants, including some which looked like mini versions of the one which appears in Mini Monkey’s favourite movie, ‘Ice Age 3: Age of the Dinosaurs’. I was slightly concerned that he was going to be terrified by the real-life version as the one in the movie eats a mammoth and a sabretooth tiger but he seemed fairly confident that they weren’t going to cause him any trouble. After a brief inquiry, he was also very accepting that there weren’t going to be any dinosaurs or any other ‘Ice Age’ characters wandering around, even though we had seen some dinosaurs earlier in the week at the Natural History Museum. * drizzle = a very ‘English’ term for a light rain that is often very persistent and can go on all day. Cost: Adult aprox $15, kids under 3 for free.